Oregon Scientific adds an adjustable, time-projection display to its award winning ExactSet™ auto-setting technology. The extraordinary radio controlled clock receives signals from the U.S. Atomic Clock to set its own time, day, date and year. It even adjusts for daylight saving time. One press of the snooze bar activates a momentary red display on the ceiling or wall. 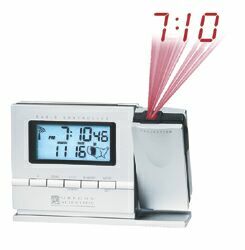 With the included AC adapter, the clock can be set for continuous projection display throughout the night. The projector can be rotated forward 90 degrees. It features a low-battery indicator, backlit illumination, digital clock showing time, date, and alarm, and an eight minute snooze. Actual size: 5.5 " x 1.5 " x 4.0"
© Copyright 1999 - 2001 Innovationhouse.com. All Rights Reserved.